Now that you’ve seen exactly why you should always be kind to Lady Luck, let’s take a detailed look at one of the crucial aspects of professional multi-table tournament (MTT) play, namely … “the art of the WSOP final table deal.” Making a bad deal in big MTTs can be a huge mistake, and in the case of the World Series of Poker (WSOP) November Nine, a bad deal decision could cost well over $200,000! Making an optimal deal at the final table of any MTT is very complex and usually not possible without a computer. This is why I’ve created a Final-Table Deals Calculator for all of you, which allows you to run the numbers before you battle it out at your live and online Texas Holdem poker tables. 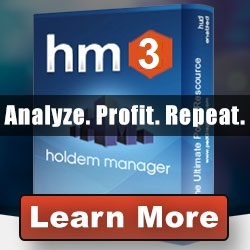 Using this calculator in connection with the holdemresources.net tournament equity calculator, you can negotiate an optimal deal based on your relative stack size and assumed edge. A CPD favors the chip-leader, and occasionally (depending on the stack distributions) also the 2nd- and 3rd-place players. An ICM deal is by far the fairest for all players, although this system is not perfect (i.e. distance from the blinds and skill differences are not considered). Given even skill, your chances of winning the tournament are approximately equal to your stack size divided by the total amount of chips left in circulation. In the case of the 2011 WSOP November Nine, this would equate to the “Stack %” in the table above: i.e. the current chip leader would only win 1 time in 5 on average. However, it seems that a few of the other players remaining this year are markedly better than he is, so I wouldn’t assume “equal skill” here. Always keep your respective “edge” in mind when deciding on a deal. Conclusion: Propose a CPD if your stack is the largest or close to it, and insist on an ICM deal if you’re in 3rd place or lower.